CD review: "The Complete Blue Note Recordings"
As outstanding a pianist as he was, Thelonious Monk is remembered far more as a composer. Songs of his such as " 'Round Midnight," "Misterioso," "Straight No Chaser," "I Mean You" and "Trinkle Tinkle" have become standards of the jazz repertoire. 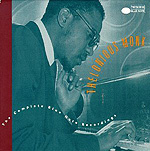 At the time the tracks in this four-CD set were laid down (1947-52), both Monk and his songs were still new to the scene. Monk had recorded as a sideman, and several of his songs had been covered by others, but his Blue Note sessions were his first as leader and started him down the path that led to jazz immortality. His idiosyncratic hesitations on piano, his startlingly bold compositions, and his complex arrangements quickly made him a sensation among jazz fans and players. Part of the reason Monk shone so brightly in these sessions is the level of talent he had surrounding him. John Coltrane played tenor sax on one of the sessions, yielding five tracks. Art Blakey or Max Roach played drums on the vast majority of cuts here, and Sonny Rollins and Milt Jackson were also present. With sidemen such as these, Monk the player found himself pushed to new heights of virtuosity. This is by no means a comprehensive Thelonious Monk collection (see also "The Complete Prestige Recordings"), but it's a complete look at a very intense creative period in a groundbreaking artist's career.